5/16" x 25' Flex Shaft with Protective Covering. Use a cordless drill with an adjustable clutch to operate. The 5/16" x 25' Flex Shaft includes Medium Chain Heads for both Roots and Grease. 5/16" Medium Grease Chain Knockers for cleaning grease and soft buildups out of 2" and 3" pipes; used for PVC, ABS, orangeburg, corrugated, clay, copper, galvanized, and cast iron pipes. 5/16" Medium Chain Knockers for cleaning roots and other tough buildups out of 3 and 4 inch pipes; used for clay, copper, galvanized, and cast iron pipes. Use with caution on PVC, ABS, orangeburg, and corrugated pipes. 5/16" Drain Cleaning Flexible Shaft in protective sheath. Great for use in 2" and 3" lines; all types of material. 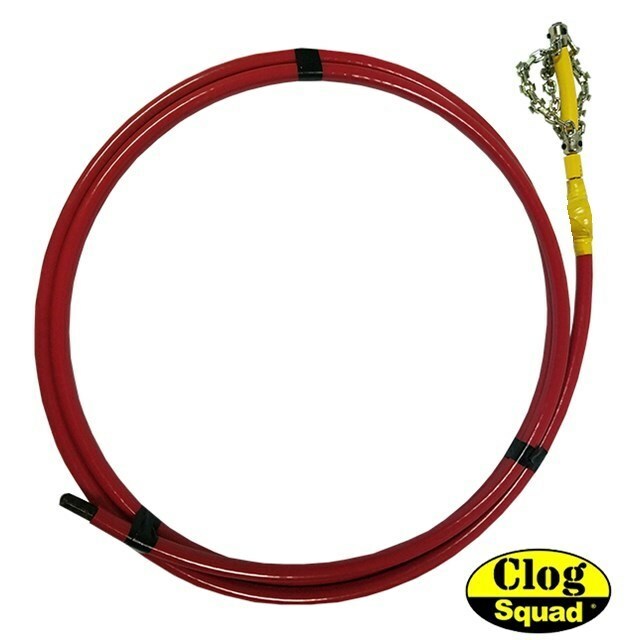 5/16" x 25' Flex Shaft includes Medium Chain Heads for both Roots and Grease.